"I like the early stuff": the classic masculine comment to make about the work of a well-known creator, demonstrating as it does the cultural consumer's dedication, purism, judgmental rigor, and even endurance (given the relative accessibility, in the intellectual as well as the collector's senses, of most "early stuff"). Now you have a chance to say it about that most ostensibly masculine of all 20th-century American writers, Ernest Hemingway. Above, see the cover of a coveted edition of the then-young "Papa"'s very first book, 1923's Three Stories & Ten Poems. The print run numbered only "300 copies, put out by friend and fellow expatriate, the writer- publisher Robert McAlmon," writes Steve King at Today in Literature. "Both had arrived in Paris in 1921, Hemingway an unpublished twenty-two-year-old journalist with a recent bride, a handful of letters of introduction provided by Sherwood Anderson, and a clear imperative: 'All you have to do is write one true sentence.'" Instead of shelling out to a rare-book dealer for Three Stories & Ten Poems — admire the sacrifice involved though a true Hemingwayite may — you can read even more of the Old Man and the Sea author's early stuff in the free e-book embedded just above: 1946's The First Forty Nine Stories. 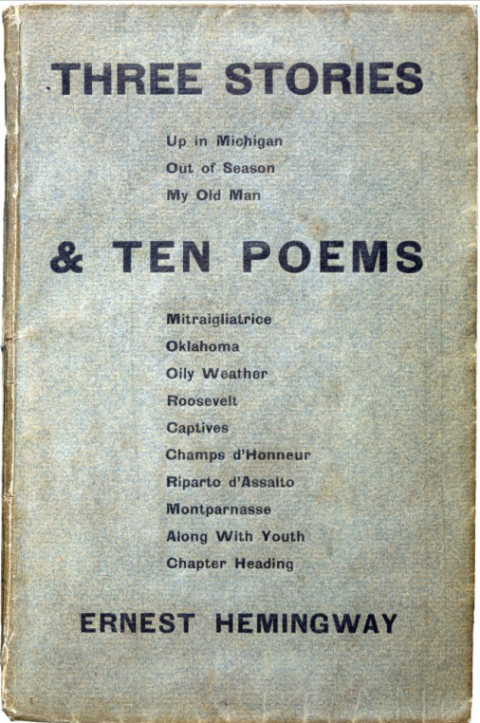 It contains not just "Up in Michigan," "Out of Season," and "My Old Man," those three stories of Hemingway's bound debut, but, yes, 46 more of his earliest published pieces of short-form fiction. Today in Literature quotes one notable contemporary reaction to Three Stories & Ten Poems, from a time before Hemingway had become Hemingway, much less Papa: "I should say that Hemingway should stick to poetry and intelligence and eschew the hotter emotions and the more turgid vision. Intelligence and a great deal of it is a good thing to use when you have it, it's all for the best." And who could have written such an astute early assessment of the ultimate literary man's man? A certain Gertrude Stein. “first published” is an interesting term. about 20 years ago hemingway’s old high school dug through its archives and printed up HEMINGWAY AT OAK PARK HIGH which includes the journalism and poems he wrote as a student in 1916-1917. it isn’t as polished, but its a great insight into how typically ‘high school’ papa’s writing was before his first world war reporting toughened up his style. Can I order Hemingway set to my kindle. I love Hemingway. His style of writing continues to challenge and inspire me to create and develop my own. But when I think of how he ended his life, I wonder whether all the struggle is worth it. I wish some one can detail for me the joy he had in life. It will reassure and encourage me. And that reminds me. Is Openculture only for the Americas, Europe and Asia? Pray what about Africa? Or in other words, what about Me? There is a book, Papa Hemingway, from the perspective of a friend of Hemingway’s during the last, I believe, ten years of his life. Its a wonderful read and really shows the type of person he was. Beyond simply the idea of a man in pain, it shows him human, mentoring and befriending a younger writer and their interactions. Note: The version of “Up in Michigan” in the 1946 “first 49 stories” collection is not quite the same as the version published in 1923. I Have this book for sale. Anyone interested?